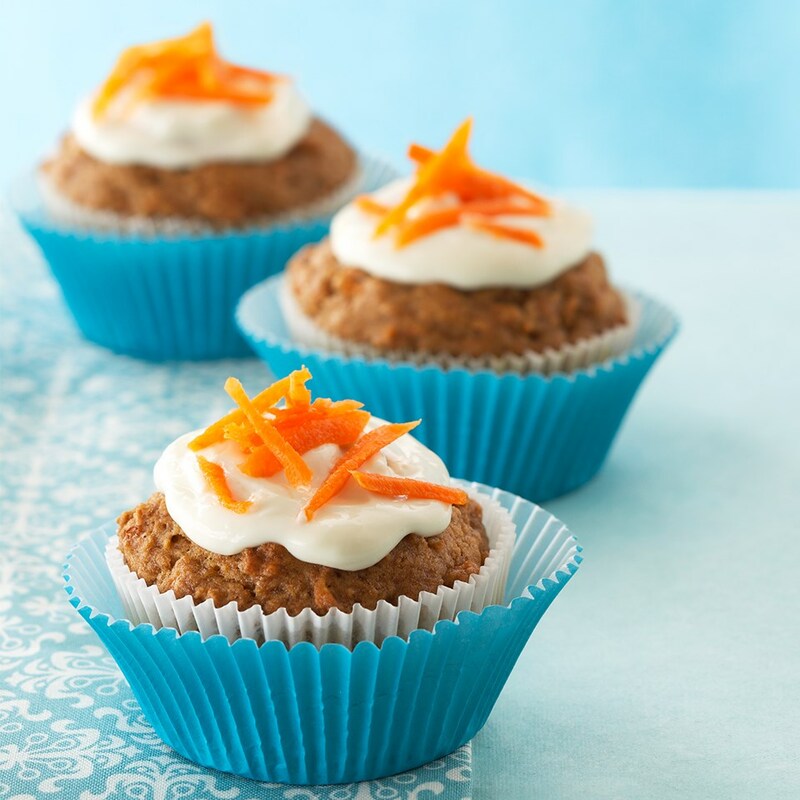 A pretty cupcake topped with a fresh carrot garnish has everything you love about carrot cake with cream cheese frosting in a handy treat. Preheat oven to 350°F. 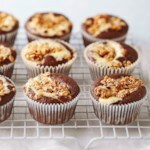 Line fifteen 2- ½-inch muffin cups with paper bake cups. Lightly coat paper cups with cooking spray; set aside. In a large bowl, stir together flours, brown sugar, baking powder, baking soda, cinnamon, salt, and ginger; set aside. In a medium bowl, combine eggs, carrots, applesauce, and oil. Add egg mixture to flour mixture. Stir until combined. Spoon batter into the prepared muffin cups, filling each three-fourths full. Bake for 18 to 20 minutes or until a toothpick inserted near centers comes out clean. Cool in muffin cups on a wire rack for 5 minutes. Remove from muffin cups. Cool completely on wire rack. 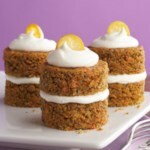 To prepare the frosting, in a small bowl, beat cream cheese with an electric mixer on medium speed until smooth. Add agave nectar; beat for 1 minute more. 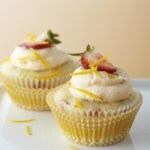 Spread frosting on cupcakes. 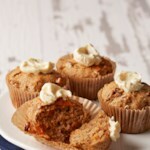 Top each cupcake with 1 teaspoon of the finely shredded carrots or one very thin carrot strip. Tip: If using sugar substitute, choose Splenda® Brown Sugar Blend. Follow package directions to use product amount equivalent to ¾ cup brown sugar. Nutrition Facts Per Serving with Substitute: same as below, except 189 cal., 215 mg sodium, 24 g carb., 11 g sugar. Daily Values: 5% calcium, 5% iron.